This open-frame wall-mount server rack provides 15U of storage, helping you to save space and stay organized. The equipment rack features an adjustable depth and can hold a total of up to 198 lb. (90 kg). With adjustable depth to as low as 12 in. 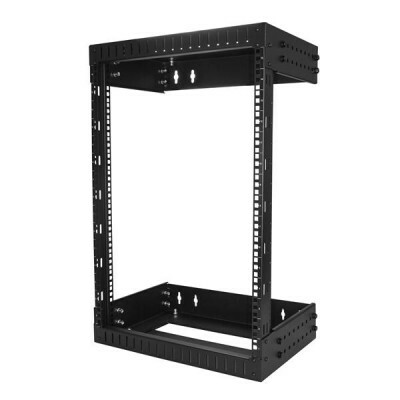 (30.4 cm) this network rack is perfect for smaller spaces. Itâ€™s easy to assemble and features wall-mounting holes that are spaced 12 and 16 in. apart, making it suitable for mounting on almost any wall, based on North American wall-frame stud-spacing standards. The wall-mount rack comes in a flat-pack, which makes it easy to transport and saves you money on shipping. 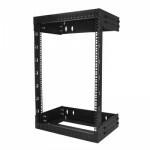 The rackâ€™s open frame design ensures passive cooling for your rack-mounted equipment. Additionally, the open frame provides easy access to your equipment and makes it easier to configure mounted devices, which saves you time. The RK15WALLOA is backed by a StarTech.com 5-year warranty and free lifetime technical support.